Now I know what to play my favorite album - Yodeling Songs of the Alps - on. My new digital lederhosen. Or maybe in. 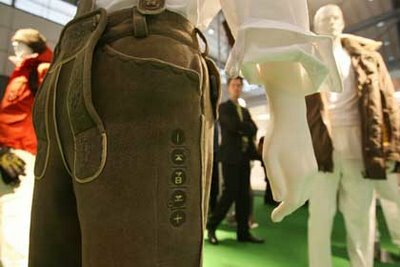 The digital lederhosen can be worn with the matching jacket when at a Bavarian beer garden - their motto is "Laptop and Lederhosen." One of the parting shots at the mega-tech convention CeBit in Hanover -- which ended on Wednesday -- was the presentation of traditional Bavarian leather pants with a built-in MP3 player, complete with cell phone reception. Instead of the traditional deer-antler buttons down the side, the digital lederhosen comes equipped with five buttons to control the mobile music maker. Digital traditionalists can also outfit themselves with a classic Bavarian jacket with MP3 control in the arm. Now, that's a sleeve communicator. Via Spiegel Online; thanks to an anonymous reader for the tip.